Macs no longer have internal DVD and CD-RW drives, but for Mac users who still need to use optical discs the Apple SuperDrive offers an external all-in-one USB solution that can read and write both CD and DVD discs, all you have to do is plug it into a USB port on the Mac and Mac OS will detect the SuperDrive. 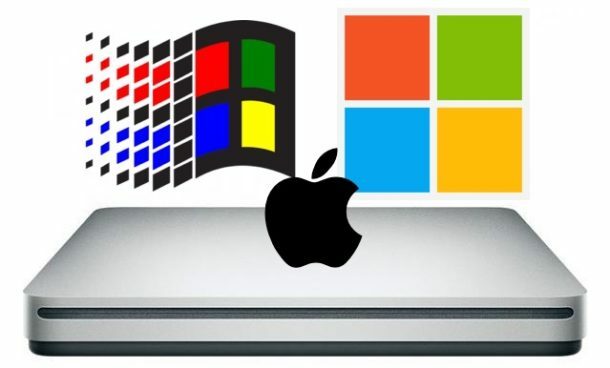 But that’s Mac OS, not Windows, and many Mac users also use Windows PC or Windows operating systems, so wouldn’t it be nice to use that Apple SuperDrive in Windows too? But SuperDrive does not always work with Windows PC right away however, and sometimes the Apple SuperDrive either doesn’t function as expected, won’t accept a disc, or is not properly recognized in Windows, whether running natively on PC, or a Mac through Boot Camp, or a virtual machine either. Whatever the scenario, if you’re trying to use an Apple SuperDrive with Windows and it’s not working as expected, try the steps below to get the SuperDrive functioning in Windows. 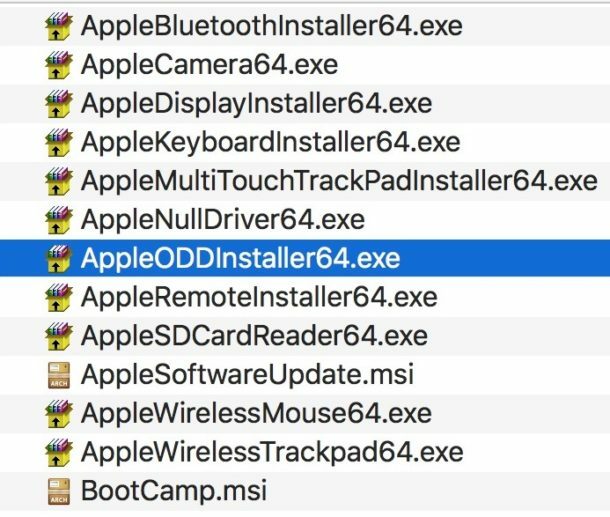 These steps are intended to be from taken from Windows, however you could download the Boot Camp Support Software on a Mac and then transfer the zip file to Windows through USB, networking, or your method of choice if need be, or you could just extract the “\Bootcamp\Drivers\Apple\ AppleODDInstaller64.exe” (note it will be labeled “AppleODDInstaller.exe” if it’s 32-bit version) file on a Mac and transfer that exe installer to Windows. You must be in Windows to run and install the actual Bootcamp Drivers for SuperDrive, however. This should work to get an Apple SuperDrive working on any modern Windows version, including Windows 7, Windows 8, and Windows 10. Note that if you’re on a notably older Windows release, you’d want to download an earlier version of Boot Camp drivers that contain the 32-bit exe rather than the 64-bit exe, and otherwise it should work the same as well. Once the drivers are installed properly in Windows, the Apple SuperDrive should accept discs, read, write, and eject them as expected, just like it does on the Mac. Of course you could also just get a different external DVD-RW / CDRW drive too at less cost, as many of the other solutions either work immediately with plug-and-play in Windows and Mac OS, but the SuperDrive situation is helpful if you already have one from a Mac, or you want to stay consistent with Apple hardware. Why buy new hardware when you have something that already works, right? The same logic applies to using a Windows keyboard on a Mac, and many other common peripherals that are compatible with both a Mac and PC, even if they require some minor tinkering to get working as intended. We could help you answer that question if you told us specifically which Mac you have. Historically, the only Macs that the SuperDrive supports are Macs that were made without an optical drive, such as a MacBook Air, Mac mini (starting in 2011), MacBook Pro with Retina Display, iMacs since 2012, etc. Interesting, this is a great tip to get SuperDrive working in High Sierra for some Macs, thanks Wojtek! Some Macs do not support SuperDrive without an added nvram command to enable the Superdrive. Not sure why the limit, since it is just DVDRW. Wojtek below posted the command, it works! Compact Disc and Digital Video Disc discs? Absolutely one of the best Apple products ever made and so cheap, I have had mine for years and though seldom used it is a great piece of equipment to have for all kinds of eventualities. I really felt my age when the poster asked what is a CD? Cheap? Hardly, you can buy a Samsung superdrive for under $30 online that is totally compatible with both Windoze and OSX. The almost $80 Apple superdrive is a massive marketing ripoff from Apple. The internal drive on my iMac failed, it will read but not burn, and bought the super drive, only to discover it won’t work with an iMac that has a drive. Nice of them to tell you that before you buy it. Please see above, Wojtek’s post has the solution. … and so cheap? Apple actually makes something reasonably priced? I switched from cd / dvd to iTunes store for music and movies a few years ago. But Apple must have done something in the background or with their software updates, because movies that I was capable to watch a half year ago, sudenly don’t work anymore. Why? Because my display is too old. I’ve paid for movies that first worked and now suddenly Apple blocks it with their HDCP system. There’a name for this practice: scam. It’s funny, Apple sells movies that don’t work on their own displays. As far I experienced the online movie sales on iTunes is not trustworthy. My dvd’s that I bought 20 years ago still work. Films bought on iTunes always gave me trouble and Apple’s custom services don’t solve all this problems. That’s why I switched back to dvd. It’s a little bit older, but it keeps working. As long there’s no decent alternative there’s not other choise. Thank you for this extremely helpful and well written instructions, it worked immediately without even a re-start. Very helpful thanks!! Apple super drive now works on my Dell Inspiron! i only was wondering if i took the dvd player out of my pc and put it in my 2007 imac would it be compatiable ?